If you're still looking for an edge in the markets, mechanical trading systems are the best way to get it. Learn more. Once you've found an "edge" in the markets -- a profitable trading system or method -- the greatest opportunity for profit lies with methods for trading your system or method more successfully. These so-called money management methods, such as position sizing, are the core of Market System Analyzer (MSA), a money management software application from Adaptrade Software. MSA is designed to help maximize the performance of trading systems and discretionary trading methods. MSA can uncover tradable profit/loss patterns, optimize trade sizes, and avoid trades and strategies that have a low likelihood of success. The result is a higher percentage of winning trades, lower drawdowns, more consistent returns, and greater profitability. View the how-to videos for MSA. Read the online FAQ (Frequently Asked Questions). Go to the Support page for Help with MSA. Who Could Benefit From Market System Analyzer? Any active trader of stocks or futures (commodities futures, currency futures, stock index futures, etc. ), whether a day trader or position trader, could benefit from Market System Analyzer. MSA contains a unique combination of analytical tools, including original methods. 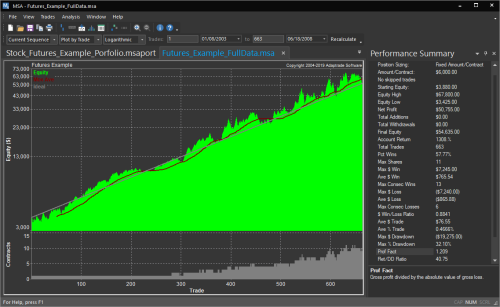 By combining analysis options you'll discover profitable new ways to trade your existing strategies and methods. You can also use MSA to detect when your strategies stop working, saving you money by preventing avoidable losses. Go to the online store to order now. Main window of Market System Analyzer. How Could Market System Analyzer Improve Your Trading? Increase returns and limit risk by trading the right number of shares or contracts for your account size and risk tolerance. Find the optimal position sizing settings to reach your trading goals. Detect over-optimized trading systems and prevent curve-fitting. Exploit winning and losing streaks. Trade equity curve crossovers four different ways to increase returns and reduce risk. Assess the sensitivity of your trading results to trade order. Evaluate your trading using detailed performance statistics that properly account for position sizing settings and account equity. Market System Analyzer analyzes "market systems" (e.g., the Euro market traded with a moving average crossover system) in terms of their profit/loss records. The program is designed to extract the maximum amount of information from the minimum amount of input data. And all analysis features in MSA are accessible from simple menu commands, making it easy to perform powerful analyses without any programming and without requiring any market data. What Do Others Say About Market System Analyzer? "This software is superb! So quick and easy to setup and use. I always think that if you can get the basics running without spending much time examining the supporting documentation it must be good and designed with ease of use in mind." "Before we found your MSA we were using Rina. Your software is 10 times cheaper and 10 times better!" "As primarily a discretionary trader, I now have a very powerful ally and tool for helping me to manage my accounts. Everyone NEEDS this tool, discretionary and mechanical traders alike. Very powerful introduction to most traders of the advanced money management strategies used by professional traders and CTA's like myself. " "Great Product!!! I am very impressed!!" "The program’s brilliant, produces just the sort of figures I’m after as a private trader.... Congratulations and thank you for a great piece of tech." "Thank you for all your help. I think I am addicted to your product MSA. ...Thank you creating a great software and keeping us little guys in mind." "As a former fund manager, trading metrics are extremely important to clients as well as back-office reporting. I think Market Analyzer should be the start and foundation for any serious trading organization. ...I now use the Market System Analyzer each week to update my own trading records." "I am very pleased with your Market System Analyzer, it is reassuring to be able to test my trading strategy with this tool." "against other programs MSA is very easy to use and understandable. my congratulations, and also the price is unbelievable." "Personally I want to THANK YOU for the best software to value on today's market. Money management analysis are - in my opinion - most important part of any system. And your software works great and is very simple to use. " "I'm a new user of MSA and very impressed after just a few hrs of use. I've tried doing this myself in Excel and find your product does an excellent job... Everything I was looking for and more. Thank you very much!" - 15 different position sizing methods so you can increase returns and limit risk by setting the number of shares or contracts based on account size and trading performance. - Position sizing optimization so you can find the best position sizing settings for your trading goals. - Monte Carlo analysis with detailed performance reporting to improve your system testing and help prevent curve-fitting. - Dependency analysis to determine if your trading system or method has a statistically significant tendency to form winning and losing streaks. - Dependency rules to exploit trade dependency by increasing winners and reducing losses. - Significance testing to determine if your trading system or method is inherently profitable and to identify over-optimized trading systems. - Equity curve crossover trading rules to increase returns and reduce risk by modifying your trading based on crossovers of the equity curve with its moving average. - A randomization feature so you can see how sensitive your trading results are to the original order of the trades. - A parameter studies feature that helps you find robust ranges of the position sizing parameters. - Detailed performance statistics to drill down into every aspect of your strategy. - EasyLanguage™ code for TradeStation™ that lets you (1) easily transfer your TradeStation strategy results to MSA and (2) add the position sizing methods of MSA to your TradeStation strategies. - Import trade data from a text file, which can be generated from a TradeStation™ strategy. Generate synthetic trade data for testing. - Specify a trade risk value in one of four ways and assign it to all trades. - Use the built-in editor to add/edit/delete trade data. - Export, copy, or print trade data and performance results. - Save a segment of data for out-of-sample testing. - Automatically perform walk-forward position sizing optimization. - Perform dependency analysis on a user-selected sliding window of trades. - Format the chart window: change fonts, line and bar colors, grid, title, etc. - To test and evaluate trading systems and methods. - For day to day trading decisions -- to decide whether to take an upcoming trade and, if so, how many shares or contracts to trade. - As an educational tool. The software is designed for both individual and professional traders. The familiar Windows interface makes the program easy to use, and detailed help files are available if needed to explain how to use each analysis feature. To get started, all you need is a list of trade results for the trading system or method you want to improve. Still have questions? Read the online FAQ (Frequently Asked Questions). Go to the online store to purchase Market System Analyzer. If Market System Analyzer doesn't improve your trading, return it within 30 days for a full refund. See our Terms & Conditions for complete details. You can download Market System Analyzer right now as a fully functional trial. After you purchase MSA online, you'll receive a download link to the licensed copy. Click here for additional information on ordering. Copyright (c) 2004-2019 Adaptrade Software. All rights reserved.